How to do your BEST at ANY sport! If you want to be at the top of your game, there are millions of things you could do. Visualize success, get more sleep, do yoga, use inversion tables, cold thermogenesis, drink BCAA’s, eat ketogenic, do physiotherapy every day…the list is endless. I mean, you could spend the rest of forever researching how to obtain optimal performance, and you’d likely never have time to implement ALL THE THINGS. Lucky for you, there’s one thing, that’ll make sure you’re in top performing mode: hydration. Yes, yes, you know that water is important, we’re made of it, blah, blah, blah. Oh, but do you really know why, as an athlete it’s important? Like REALLY important? 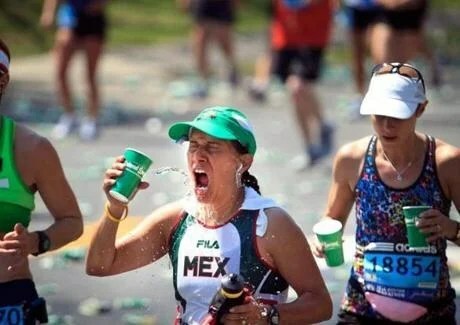 Well, maybe it’s because your VO2 max can decrease up to 11% when you are dehydrated. Less water in you = less blood to circulate oxygen = less oxygen for muscles = less performance. Dehydrated muscle cells can’t properly metabolize the bits they need to repair themselves. Water is part of the lubrication system that keeps your joints/tissues/nerves/etc. sliding around each other properly, which means dehydration leads to a limited range of motion when tissues get gummed up together. Improper electrolyte balance from dehydration slows down the chemical reactions that keep your body moving, stealing away precious, precious energy. Any of those things sound good to you? No, didn’t think so. Drink 2-3 liters per day. For serious. Don’t just drink water. Drink pure water when you eat. Add a pinch of salt or some electrolyte powder if you’re drinking sans food. For serious. You might think ‘electrolytes’ are just a catch phrase to sell sugary sports drinks, but they are essential to keeping you hydrated properly. There’s a balance your body needs to maintain (see electrochemical processes above) and dehydration isn’t the only thing to throw it off. Exhibit B: hypo-hydration, where you slam TONS of water but your body doesn’t absorb it. Ever up your water intake, have to pee like crazy, but still feel thirsty? You’re not crazy, just not properly hydrating. Add a pinch of salt to your water bottle each time you fill it, and you’re good to go. Or go ahead and grab some non-sugary electrolytes like Nuun tablets – they taste delicious, and research says more flavour means you’re more likely to drink up! Need some performance help beyond hydration? We can help. Set up an appointment with any of our physiotherapists or nutritionist Ottawa by calling our Orleans, Barrhaven or Westboro office. It’s HOT. The siren song of the ice cream truck is calling, and the air conditioner is whispering sweet nothings in your ear. But you’ve got a competition to win! You’ve got a race to train for! You’ve been cooped up inside all day and need to get your nature on! So how do you handle the hot weather, especially when you need to be in beast mode? Pre-cooling friends, pre-cooling. 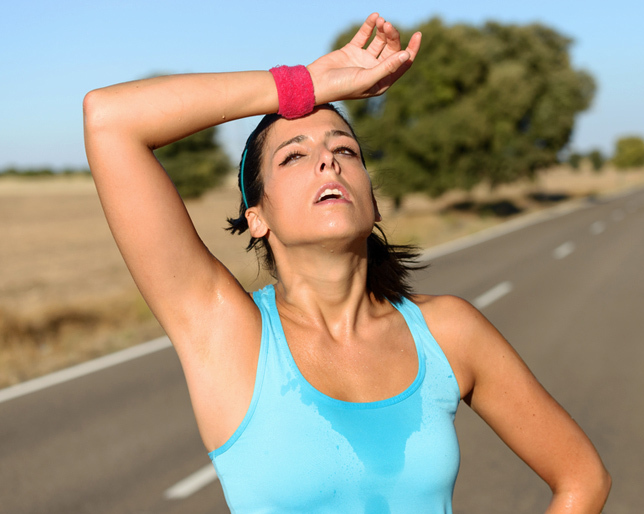 Exercising in the heat saps your energy way faster than normal, as your body tries to deal with the hotness. It’s response is to up your sweat game and to shunt blood from your core towards your skin. These are great ways to ditch some internal body heat, but they ramp up your heart and decrease the blooood (said in a dracula voice, obviously) going to your muscles, which is why your workouts feel so much tougher come hot days. Here’s where pre-cooling comes in: it helps you lower your core body temperature before you start exercising. That means you can go harder for longer, before your body hits it’s hot high-point and starts working extra hard/slowing you down. While studies have shown heat zaps an athelete’s performance, studies have also shown that pre-cooling can boost performance when it’s hot and humid out. If you’ve got your own tricks to stay cool, leave them in the comments! And if something other than the heat is keeping you immobile, you can schedule an appointment with our physiotherapists or nutritionist Ottawa by calling the Orleans, Barrhaven or Westboro office of Ottawa Physiotherapy and Sports Clinics. SPRING! Fiiiiinally, am I right? After a long winter, your body has probably been craving some good, hard, outdoor workouts…and if you spent the winter huddled under warm blankies, you’re probably feeling a wee bit sore. What causes DOMS?! Uh, not lactic acid in your muscles. A recent study found DOMS is actually due to the microtrauma your muscles and connective tissue go through during exercise. The tiny tears your muscles endure during exercise become inflamed, and that’s what causes the soreness. Muscle damage is bad! It sounds bad, but it isn’t. The muscle trauma you experience stimulates protein production and muscle growth, which helps your muscles repair themselves. That means they’ll be a little bigger and stronger; their mechanism to keep the inflammation/soreness at bay. No Pain No Gain! Not exactly. Studies show being sore the next day isn’t a good indicator of how effective your workout was. Plus too much soreness can be a bad thing – say three days after crushing a workout you immediately go into muscle failure doing the same exercise: you probably did too much the first time around. Fit people don’t DOMS! Nope. While working out regularly will cause you to feel less sore as your body adapts to your workouts (see above), change it up and you’ll likely find your good friend DOMS again. It’s also genetic: some people are way more sensitive to pain and soreness, no matter how fit they are/aren’t. How to deal with DOMS?! There are lots of options: sports massage, foam rolling, hot/cold showers, epsom salt baths, topical magnesium and sleeeep. Think you’re struggling with pain that’s beyond DOMS? You can schedule an appointment with any of our physiotherapists by calling the Orleans, Barrhaven or Westboro office of Ottawa Physiotherapy and Sports Clinics. SET A GOAL: This is where you start. Now, while “get healthier in 2015” is a goal, it’s not smart! I mean, it’s clearly an intelligent thing to pursue but it’s not: Specific, Measureable, Achieveable, Realistic, Timely. What is a smart goal? How about I will run 5k in under 30 minutes by March 31 or I will lose 1″ from my waist in 4 weeks or I will do my physio exercises as often as prescribed and log my progress for each appointment. Notice that it’s set A goal. Don’t go crazy – baby steps mean you’re more likely to avoid burnout or two-weeks-in-give-up-itis. WRITE IT DOWN: Doesn’t matter what your goal is, forget about it and it’s not going to happen. Writing it down helps you cement it as a priority, and means you’re taking a little more time to think about it. MAKE MOVEMENT MATTER: Don’t have 2 hours to do WODs at the crossfit box everyday? That’s cool, but if you want to get fit, you need to make fitness a priority. It could be a brisk run every morning or yoga in your basement once the kids are asleep. You’ve just got to make the time. P-L-A-N: Failing to plan? Then you’re planning to fail. You’ve heard it before, and it’ll never stop being true. Want to eat healthy? Then you’ll need to prepare meals instead of just picking something up from the drive through. Planning a morning pump class? Pack your bag the night before. Fit people don’t just end up being fit. They plan it. MAKE MOVEMENT MATTER (II): You’re fitting workouts in, and that’s awesome, but don’t waste your own time. If you’re not seeing positive results, think about changing the speed, length or intensity of your workouts. In the beginning a 15 minute walk might be a huge accomplishment, but you need to keep challenging your body as it adapts to what you throw at it. SET A REALISTIC GOAL: Remember, your goals need to be smaRt! Choosing a realistic goal means setting yourself up to achieve it right from the beginning. You might want to lose 20 lbs, but you’re not going to do it in a month. Try breaking that huge goal into little, attainable goals, like 4 lbs. a month, and your successes will help keep you motivated above and beyond your initial goals.